Guest Blog author Katie Brauckmann has worked with the Fairfield Foundation/DATA Investigations for three years, first as a volunteer and intern, and now as a part-time employee. Katie is a sophomore anthropology major at James Madison University. The Hall Site (44MT0173) is a predominately 18th-century site located in Mathews County, Virginia. Conrad Hall, former President and CEO of Dominion Enterprises, extensively researched his family’s genealogy hoping to find his family’s ancestral home. He traced his ancestors, Robert Hall (1735-1781) and Ann Hall (1735-1796), along with their son Thomas Hall (1764-1840), to the Port Haywood area of Mathews County. Working with local landowners, we conducted a shovel test survey and discovered a concentration of artifacts dating to the 1700s. Then, in order to learn more about this occupation and determine if it linked to the original Hall family occupation, we began opening 5 foot square test units. To date, we’ve excavated 20 test units in this area. We have three main goals: determine the time of occupation, the nature of the occupation, and whether or not the site was the home of Conrad Hall’s ancestors. 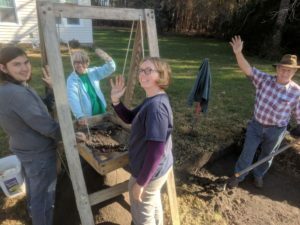 Volunteers and staff excavate at the Hall Site. The first way we do this is to look for features, which are evidence of past disturbances in the soil, like digging a cellar or installing a support post for a building. The very first test unit dug on the property revealed the remnants of one of these historic postholes, with brick and English delftware visible on the surface. Twelve feet to the north, another posthole was uncovered; and another twenty-four feet north, we found another. We searched for a posthole in between those last two, but there was major disturbance – perhaps from a tree hole or an animal burrow – that made discerning any postholes in that area impossible. In addition, we found a large feature in between some of these posts. 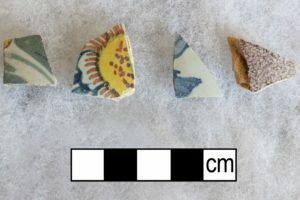 The southern half of this feature was excavated, producing 18th-century artifacts such as delftware, creamware, white salt-glazed stoneware, and tobacco pipe stems. This feature may have served as a small cellar, which would further indicate the presence of a domestic building. While it appears likely that there was a building on this site, analysis of the artifacts may be the key to determining if that building belonged to Conrad Hall’s ancestors. One of the most remarkable aspects of the Hall Site assemblage is the vast array of ceramics, from polychrome-painted delftware and hand-painted creamware to less-elaborate whiteware, and just about everything in between. By count, delftware dominates the ceramics, followed closely by creamware, pearlware, whiteware, redware, and white salt-glazed stoneware. Using these ceramics, we can calculate a Mean Ceramic Date (MCD) of 1748. The MCD is calculated by multiplying the mean manufacturing date of each ware type by the total number of sherds of that type. These values are added together and then divided by the total number of sherds in the whole collection. The MCD is not a concrete date; rather, it suggests a date for the heaviest discard of ceramics, which usually relates to the most active time of occupation. 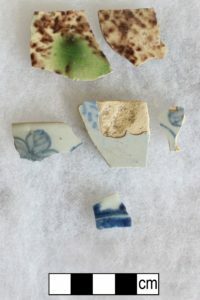 The MCD of 1748 suggests strongly that there was a lot of activity on the site during the mid-1700s, while the variety of ceramic types indicates an occupation that likely stretched from the early 18th to the early 19th century. 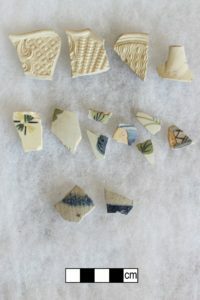 An assortment of historic ceramics recovered from the Hall Site, including Whieldon, Delftware (tin-glazed earthenware), Chinese Porcelain, White Salt-glazed Stoneware, polychrome hand-painted Pearlware, and Westerwald. In addition to the ceramics, nails, and glass, there are other interesting diagnostic artifacts from the Hall Site. Perhaps most noteworthy are the two Spanish one real coins cut in half, one of which is pierced with a hole and dated “__33” – presumably 1733. 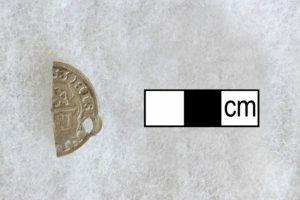 Pierced coins such as this were often worn to commemorate a specific date. The other one real (from a different coin, as it was cut at a different angle) reads PHILIPPUS V on one side and [HIS]PANIARUM on the other. Philip V of Spain ruled from 1700 to 1746, which would date this coin to the first half of the 18th century. Spanish coinage was the most common currency available during the colonial period, and these coins were often cut into halves or quarters in order to make change. 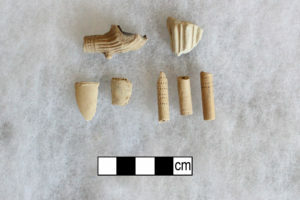 A fascinating range of kaolin clay tobacco pipe fragments was also recovered. A relatively large percentage of these pipes sport maker’s marks, rouletting, or molded designs. As we do more research into the marks and the molded shapes we will have a better sense of when these date to as well. 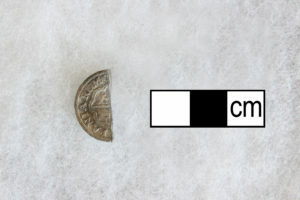 Other interesting artifacts from the site include two cut Spanish one real coins (one pierced) and an assortment of imported tobacco pipes with maker’s marks, rouletting, and molded designs. The grouping of artifacts does indicate a domestic site, but its exact nature remains unknown. 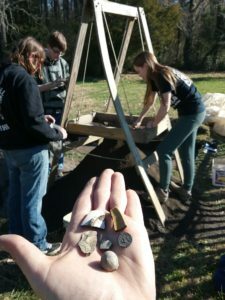 The artifacts could represent a manor house, slave quarter, tavern, or kitchen. There does appear to be evidence for at least one structure, based on the evenly-spaced postholes and a small probable cellar, but we have not yet found enough matching posts to confirm its dimensions and orientation. A greater sample of ceramics and pipe stems would also help us refine the tentative conclusions above. The most significant question still remains: is this the site of Conrad Hall’s ancestral home? The majority of the ceramics, nails, glass, and other artifacts correspond to the correct period in which the Hall family would have resided on the property. 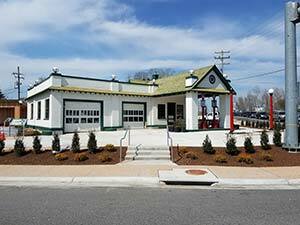 In addition, the Hall family’s main source of income – as merchants and seamen – was booming at the time, cementing their place as an upper middle class family, which is corroborated by the quantity and variety of ceramics on the site. The likelihood of this being the ancestral home of Conrad Hall is high, but not yet certain. Further archaeological testing is ongoing to discover more about the potential building and how this site would have looked in the 18th century. Once we have answered these questions we will work to preserve the remainder of the site for the future. We are excited to see what the Hall Site will reveal next!